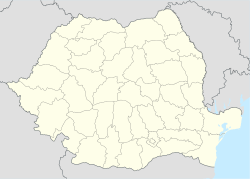 For the village in Bistrița-Năsăud County called Tóhát in Hungarian, see Nimigea. Ulmeni (formerly Șilimeghiu; Hungarian: Sülelmed; German: Ulmendorf) is a town in Maramureș County, northwestern Romania. It is located on the left bank of the Someș river. It was declared a town in 2004. The town administers seven villages: Arduzel (Szamosardó), Chelința (Kelence), Mânău (Monó), Someș-Uileac (Szilágyújlak), Tohat (Szamostóhát), Țicău (Szamoscikó) and Vicea (Vicsa). In 2011, 53.6% of inhabitants were Romanians, 23.7% Hungarians and 22.5% Roma. In 2002, 69.5% were Romanian Orthodox, 23.2% Reformed, 4% Pentecostal, 1% Greek-Catholic, 0.5% Roman Catholic and 1.3% stated they belonged to another religion. Wikimedia Commons has media related to Ulmeni. This Maramureș County location article is a stub. You can help Wikipedia by expanding it. This page was last edited on 14 July 2018, at 21:12 (UTC).